And we’re back and I am triumphant!!! SPOON! (the comic for the Soups, Stews & Other Stove-ables chapter) is now scripted. Oh, it was agony, and it really needn’t have been, but it is now written and I feel so. much. better. It wasn’t so much writer’s block as just… honestly? I don’t know. At any rate, now 3 of the 7 (the Intro and 2 chapters) have been scripted for the comics section and I will soon be embarking on the next chapter. In the ‘Aw, Rats!’ Department (maybe not the best department name consider we’re a food site, here!) my Kitchen Day got postponed due to extenuating circumstances. But we’re back on for this weekend, so Beef Wellies? (not the galoshes) here we come! Mmmm. Another one from my Medieval cooking days, this one features pork and beef rolled up with a layer of spinach and Swiss cheese and it is absolutely delicious. I last served this for a movie party and it was a definite rave. You know what a roulade is? A fancy word for rolled-up yumminess. Not only do you get to work out some aggressions by pounding chicken thin with a mallet or spare frying pan, you get to fill it with veggies and serve it with a cream sauce. Okay, I’m still deciding what to do with the ribs, but they’re going to be good. It’s pork, and pork is good. A basic curry that is great to serve a crowd, not too spicy, and keeps well for leftovers and reheating. I’ve purchased some Naan but it’s just a back-up; I want to make some myself and see how it compares. Served with some garlic green beans, this is a go-to dinner party recipe (though the topping is new–usually I use mushrooms but we’re going for something a little different). Even though the majority of the recipes in What to Feed Your Raiding Party are geared for group meals, I also want to include some alternatives for those occasions you might only be entertaining one or two and want to go the extra mile. This is one of those extra-mile dishes. A nice vegetarian dinner to round out the weekend and a good dish to make-ahead and freeze or bring to a pot-luck. The ambrosia (fruit salad) goes well with it because it’s a light flavor to balance the heavier spinach and cheese stuffing. But first, tonight, I prepared 5 Spice Shrimp on the Grill with Tri-Pepper Couscous. 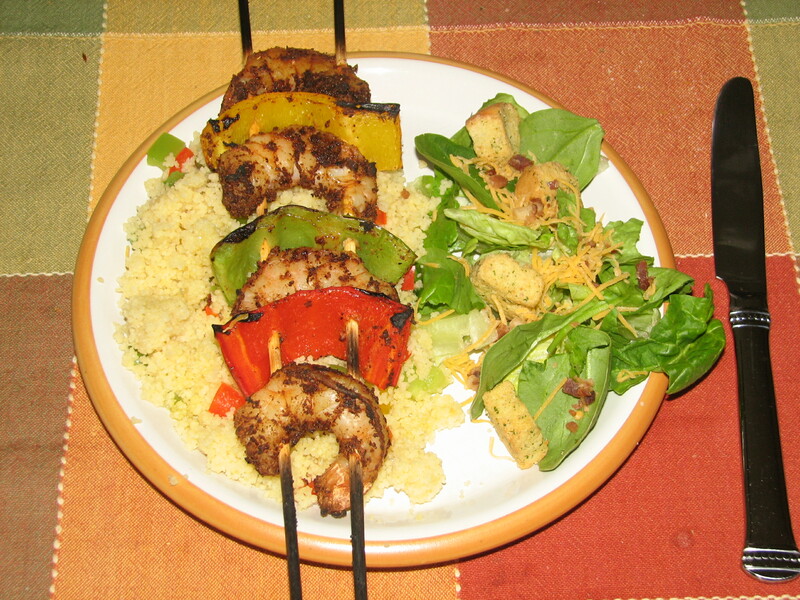 Nice and fast for an evening when I have a lot to do besides dinner–shrimp take just minutes on the grill, couscous cooks just a fast. In fact, the longest part was letting the skewers soak for 30 minutes to keep them from catching fire! Speaking of fire, though, this was a little too hot for me. I had to grab some blue cheese dressing to dampen the 5-spice flames. For the book I’ll be toning it down a bit but those who order Nuclear Wings can feel free to up the stakes–just keep some milk handy! Food & Game Pairing: Monkey Madness!